How sly those crazy guys at Broccoli are! After putting out a safe series like Di Gi Charat, they're already pushing a new manga serial with a huge amount of ancillary material just waiting to translate and ship. At least, they could be. Who knows? What I do know is that Juvenile Orion is based upon a card game sold in Japan, apparently developed in part by Enix, which is now Square-Enix. It was, according to this volume, also produced by Broccoli. Got that? Good. Considering the origin of this series, it stands on its own rather well. I never played the card game, but the story is already interesting, and the rules of the game allow for a relatively complex storyline. As the catchy song declares, "this is the dawning of the Age of Aquarius." I couldn't resist. Five ancient factions are all vying for control of the fate of the Earth, operating outside the awareness of the average person. Mana Kirihara, a sixteen-year-old student, gets pulled into this subculture as she is reunited with a childhood friend she's not seen in seven years. For some reason, her friend, Kaname Kusakabe isn't as happy to see her as she is to see him, but Mana's concern for her friend is pushed aside when Kaname's friend, Naoya Itsuki, takes her up to the roof and attacks her. He accuses her of being a Mind Breaker - the same term that is used for players of Aquarian Age - and uses a strange force to attack her. When Kaname shows up to defend Mana, claiming that he didn't want to see her again, things get confusing, but everything really goes crazy when Kaname sprouts huge black wings from his back and attacks Naoya, almost ripping him apart. Not much is left for the first volume to explain, save that it appears as if the power of a Mind Breaker is to bend another person to his or her will, for soon after Naoya's attack against Mana, he becomes another defender of the girl. We have yet to see what kind of enemies they will encounter, or how long this series will go on, but it's interesting so far. 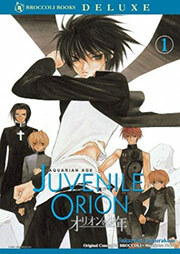 Juvenile Orion is a well-drawn series, focusing more on characters than objects. The manga is populated with plenty of pretty guys, or bishonen, designed to flutter the hearts of its target female audience, but as most shojo goes, it also has an appealing storyline to draw the rest of us in. This is a high contrast piece, with some pages being primarily black, and others being mostly white. Broccoli may be a local newcomer to manga, but they've been a player in the game for much longer than they've been in America. It's not surprising to see that they know how to produce a book. The glossy cover page highlights Kaname and the other attractive, yet strangely feminine guys that star in the series. The graphic design is sharp, with a subtle logo on the top and a clean logo. The book is the same size as any current TOKYOPOP publication, page count and all. Inside, we're treated to a color page to begin with, and then a character profile page. Character profiles are wonderful things. At the end of the book, there's a comprehensive guide (10 pages) to the card game, including a complete card list of the first series. I find that somewhat suspicious. Seriously, though, it's pretty exciting to think that we may soon be flooded with even more neat stuff related to anime or manga. Who knows, maybe someone will localize the epic fantasy series, The 12 Kingdoms? As should be expected from a major - if yet unknown to Americans - contender in the manga industry, this is a very nice release. A few more of these, and Broccoli will have its foot firmly in the door of local households everywhere. Who knew Broccoli could be so good? Even without cheese!